"Education is the greatest equalizer of all men," says American educator Horace Mann. To ensure that every learner regardless of their background will be able to receive quality education, the Republic Act No. 10931 or the Universal Access to Quality Tertiary Education Act along with the Republic Act No. 10533 or the Enhanced Basic Education Act of 2013 were implemented. 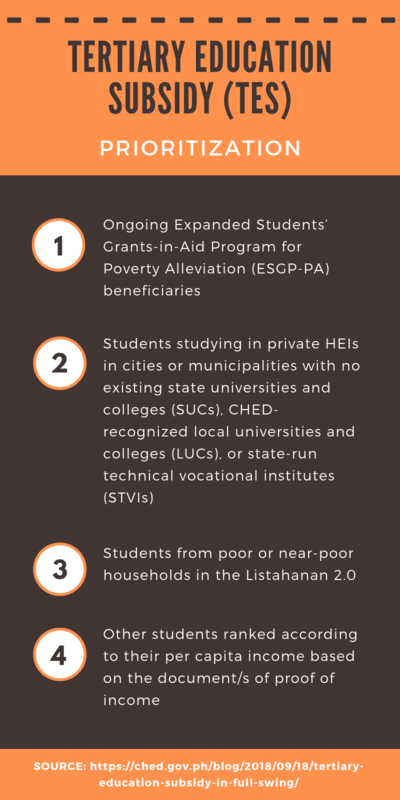 With these, the Commission on Higher Education (CHED) launched the Tertiary Education Subsidy (TES)program as the Department of Education (DepEd) also implemented the Senior High School Voucher Program (SHS VP). Committed to providing learners from all walks of life with the opportunity to gain real life education, STI gladly accepts and welcomes students in their campuses under these government-funded financial assistance programs. As part of our country’s aim to educate the citizens, the Tertiary Education Subsidy (TES) is one of the four major components of the Republic Act 10931or the Universal Access to Quality Tertiary Education Act. It offers grants-in-aid program for the underprivileged students enrolled in Higher Education Institutions (HEIs). To extend assistance to qualified students, TES provides subsidies to support their college education. With this, students can receive financial support from the government to cover a cost of their tuition, transportation allowances, and boarding as well as books and supplies. TES also allots money for the students’ initial application of professional license or certification, along with the included notarial fees, review class fees, insurance premium fees, and documentation fees should they need to pursue it. Persons with disabilities (PWDs) are entitled to an additional allowance for their special services, personal assistance, transportation, equipment, and supplies during their schooling. Visit your nearest STI campus now to inquire. Our school personnel will be happy to assist you with all your concerns and questions regarding TES and enrollment. See this link for our campus directory. 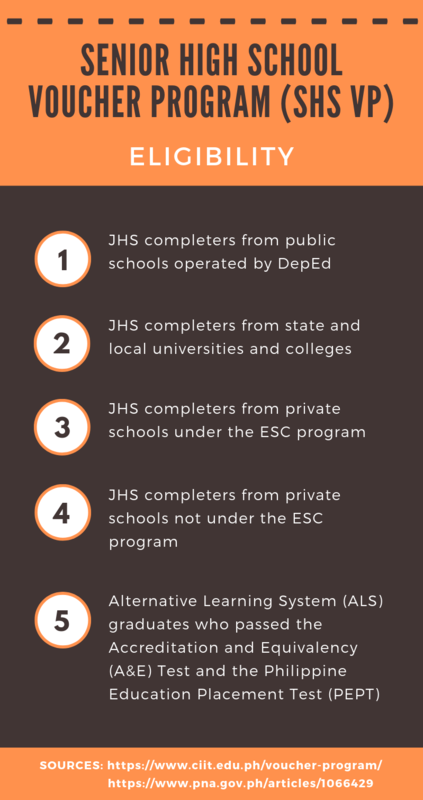 On the other hand, Senior High School Voucher Program (SHS VP) is an aid from DepEd that aims to help junior high school (JHS) completers pursue their chosen senior high school (SHS) track. It allows them to enroll in SHS with a lesser burden when it comes to high costs of school fees. The program lets JHS completers experience quality education to attain their goals at a lower price. With this, a voucher certificate is provided to students from both the public and private schools. The completers from public schools may avail their vouchers from DepEd. Meanwhile, students from private schools may proceed to Private Education Assistance Committee (PEAC) for the Education Service Contracting (ESC) grant. The voucher recipients shall be accommodated in the program upon enrollment in any SHS VP participating school. With the existence of the Tertiary Education Subsidy (TES) and Senior High School Voucher Program (SHS VP), students from a variety of backgrounds can now have access to quality education that will help them pursue their chosen career path. STI firmly upholds programs such as TES and SHS VP that aim to make education accessible to all. To know more about the said programs, you may now visit your preferred STI campus to inquire.